What is Tai chi quan……..? Taichi – Taiji This question is covered in much more depth in our lecture series. It could be said that Taiji quan is an internal martial art, that is a physically applied aspect of the Chinese science of Yin and Yang, or the nature of opposites. It is a fighting style that was developed after generations of scientific study in the martial arts, and is still developing today. Taiji quan today is most easily recognizable by the martial arts form that groups of elderly people can be seen practicing in parks. This is mainly due to the fact that one great side effect of it’s scientific strategy is that it promotes a health body and boosts the condition of the internal organs. is taught in your program..? The full course in BUPE covers all the Major family styles, as well as the modern competition styles. During the course of one study term a student can only learn so much though, but all of the major forms are available for learning. If a student has a particular form he or she would like to learn, and it is not being covered during the time of attendance then it may be arranged for that student to have private lessons in the desired form. But don’t fall behind in your regular course work. Pushing hands is also introduced when a student shows more proficiency in the basic courses. Also as part of the course. What is an internal martial art..? rather than using brute strength to apply their power. From a position of muscular system, internal martial arts tends to rely more on skeletal alignment and tendon strength rather than larger muscles movements for their applications. Internal martial arts tend to be more scientific in application and training methods, build fundamentals deeply before actually giving the meat of fighting applications to a student. This is truly a question that cannot be covered in a simple faq. What good is Taiji quan if it is so slow..? You may have seen mostly elderly people practicing Taiji very slowly, and even younger practitioners do it slow. This is the form they are practicing. The form is practiced slowly in most Taiji styles, although there are fast explosive forms as well. If one is asking what good is it, I assume you mean in a fight. In actual applications and self defense situations the moves are sped up to actual fighting speed. Of course you can’t move so slowly and expect to overtake an opponent with fast reflexes. But the inner peace and quietness gained by training the form slowly, can help one to slow down a situation in ones mind, giving you an opportunity to analyze physical data more clearly. There are many benefits of training slowly, but if you only train the form and never think about fighting applications don’t fool yourself into thinking this makes you a better fighter. One has to keep clear that forms are forms and fighting is fighting, forms give you the basics and a chance to analyze your own positions. If you want to fight you must fight and think about actually applying techniques. Why do people practice Taiji quan so slowly..? Training slowly has several effects, for one it allows you to improve your stances and positions through self analysis. Having more efficient postures and eliminating gross wasted movements is one of the major benefits of Taiji quan practice. If you do it fast you don’t have time to analyze, even in Fast form styles you do it slowly in the beginning. Also Taiji practice is one way to bring a practitioner to a meditative state. Moving fast boosts the heart rate, hastens your breath, constricts the muscles and blood vessels cutting blood flow to the brain and pumping more blood into the muscles. These physiological changes make it quite hard to remain in a meditative state. Taiji quan is also a form designed to train you to keep your heart rate even and blood flow balanced even though you are in a stressful situation, such as combat. Training slowly keeps you in stressful stances for longer periods of time thereby increasing your strength in fighting postures much faster than training at fighting speed would. Slow training at first can be very stressful, you may even find your legs shaking, this is because your body takes time to adjust to new physical stimuli. In time you get stronger, and when you are stronger you will then start to be able to relax more. One other point in Taiji that many people are concerned about is breathing control, when you move slowly you are able to control your breathing more than if you were at a sprinting speed. Isn’t Taiji just for old people..? Absolutely not. In fact people who begin practicing earlier benefit more from Taiji than those who begin at more advanced stages in life. One of the main reasons for this is that the body adapts to new stresses more quickly at younger ages. Many of the better masters we see tend to be quite old, this is true, but they didn’t just begin. Many of the world’s top Taiji masters have been training the art since early childhood, a lifetime of practice got them to the stage they are at, They probably were even quite skillful at very young ages, but they just happen to be a little more experienced and much wiser at the older ages, so their skill is that much greater. I heard Taiji is a fighting art, is that true..? Yes absolutely. 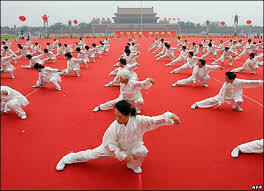 It is hard to see it when you see a group of elderly people doing the forms at a very slow manner and in a fuller non aggressive attitude, and usually these days many people are not taught the fighting concepts of the art. I have heard people advertise Taiji as the peaceful martial art. I have also heard of people who take up the art because it does not involve combat, nothing could be further from the truth. Taiji does promote inner peace, and quietude, but it’s fighting applications are some of the most scientific, and some might say most vicious of all martial arts. While the numbers are far less, there are those that still understand the true nature of the art today. Taiji quan is a complete art, and it’s gifts in all areas can only be realized if it is fully investigated and understood, cutting oneself off from one part of the learning is detrimental, and restricts a practitioner from ever attaining the highest levels. I am not saying one must learn to fight and then go around killing people, but knowledge of fighting in the art opens up subtle doors in the more peaceful aspects that may not have been seen in a more basic study. Pushing hand is the first introduction a Taiji practitioner will have to human interaction with the art. It is the foundation for the fighting aspects of the art, but it is more as well. Pushing hands offers a practitioner the opportunity to work with a classmate to test and see ones strengths and weaknesses, it allows one to gauge their own development, and is a handy tool for identifying shortcomings or unseen mistakes in one’s form and postures. Pushing hands itself has developed into a competition of it’s own. There are yearly competitions around the world now, and many participate, unfortunately some place pushing hands proficiency above actual taiji proficiency, thereby digressing it into a tug of war match testing each others strength rather than actually utilizing true taiji fundamentals. The problem there is that lower level practitioners have made an advancing tool the focus of their practice, thereby impeding their own advancement. It is key when practicing pushing hands, that you are not competing with your partner, (unless you are actually taking part in a competition of course) Pushing hands is a tool for one to self analyze and help a partner do the same. Are there different types of Taiji?, What are they..? There are five main styles of taiji or families. These are Chen, Yang, Wu, Wu, and Sun. In addition to those styles, several modern competition styles have been created, 42 forms/ 24 forms/ 48 forms/78 forms etc but mainly the 42 forms and the 42 sword forms. These are the most prominent styles, inside those styles themselves there are several subdivisions. There are several smaller styles that were developed outside of these styles as well, but never became as famous. There is no one style that is really better than another, it depends on personal taste, and body type. The theories inside are also slightly different, and some of the developments within the styles represent the generations of research. Martial arts is a science that develops along with those who train it. You can’t keep down the human mind, we discover new things about old ideas everyday.